It is, honestly, a little hard to believe. 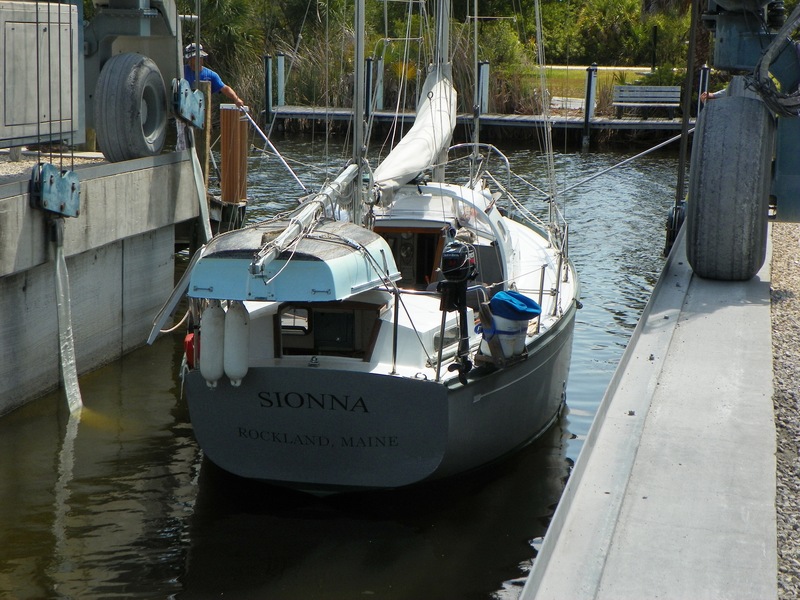 In just a few days, (10 to be exact) the crew of the good ship Sionna will be loading up the car with the parents/in laws, and heading south again. This trip to Florida will be quicker than the last – 5 days, instead of 5 months – but it still marks the transition from land-based to water-based no less distinctly. We’re taking the plunge again! And with a return to the boat comes – of course — boat bling! We learned an awful lot in our 8 1/2 months aboard the boat last year. We learned what works for us, what didn’t work, what was missing, and what we had that – really — we didn’t need to have. Naturally we’d like to correct any deficiencies, so those items we determined to be “missing” were on a short (but rather expensive) list of things to take with us this fall when we return to cruising. What sorts of things? 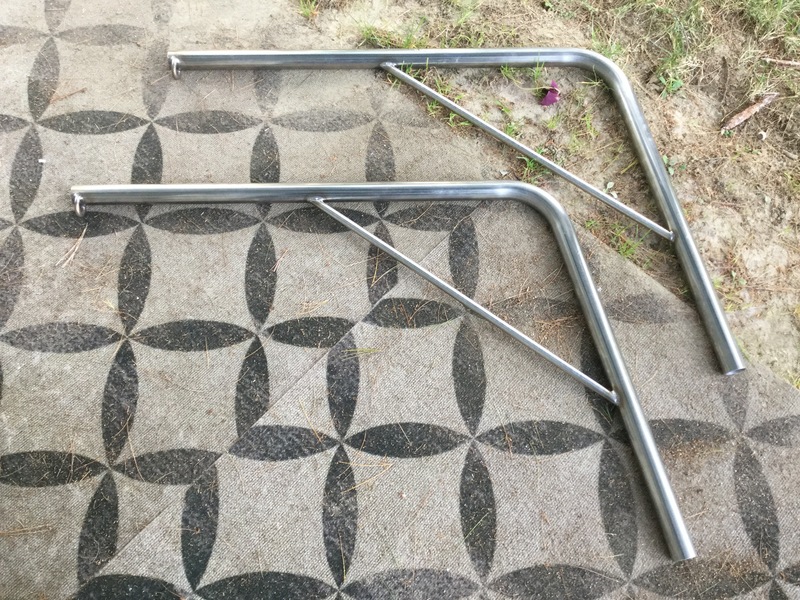 Well how about a new sail? One of the things we were warned about (by the sail-maker who looked over our sails for us) before we left was the condition of our headsail, the most-used sail in our rig. It was the oldest sail aboard at 13 years, and was showing it, with weak stitching, stretched out shape and daylight visible through every stitch. “Last season”, he said. “Plan to replace it after one year in the sun”, he said. And he was right. The numbers just weren’t adding up. 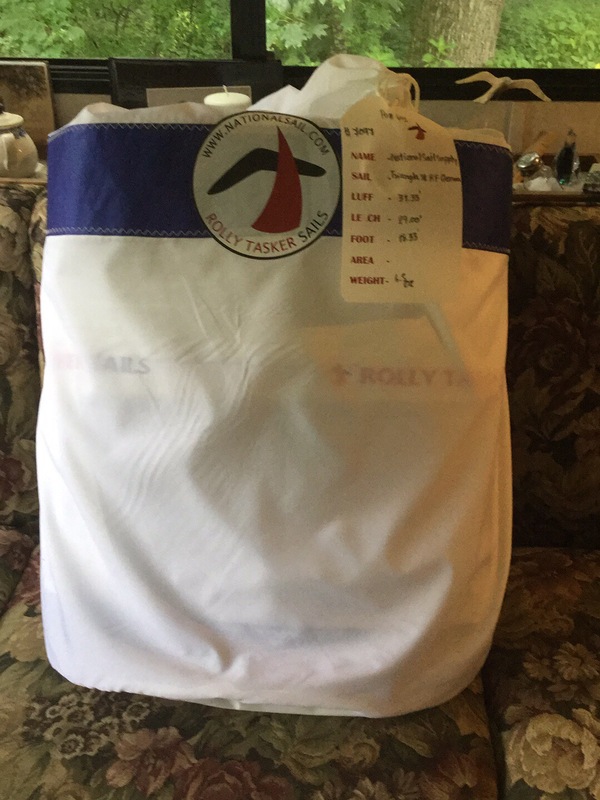 Then we discovered that a company called National Sails out of Florida could make us one for $1300. Brand new. Never used. Serious crispy, krinkly, new-car-smell action. So we did it! 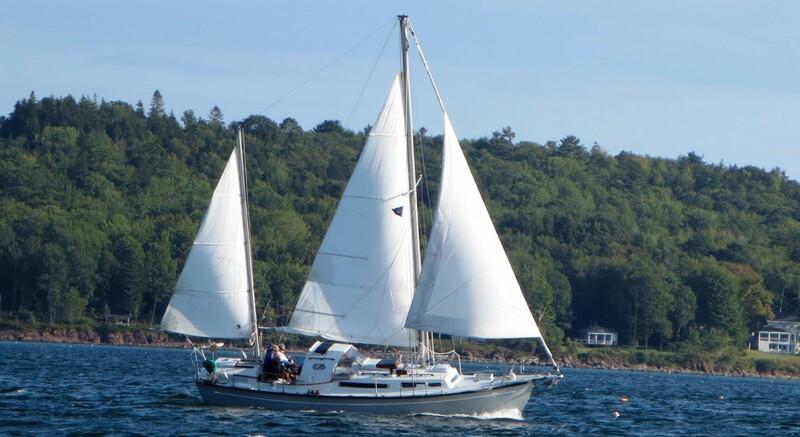 We ordered a new sail, which is even now begging to be taken out for a test drive. At least, it will be, as soon as we have a boat to put it on! And what else? Why davits, of course. 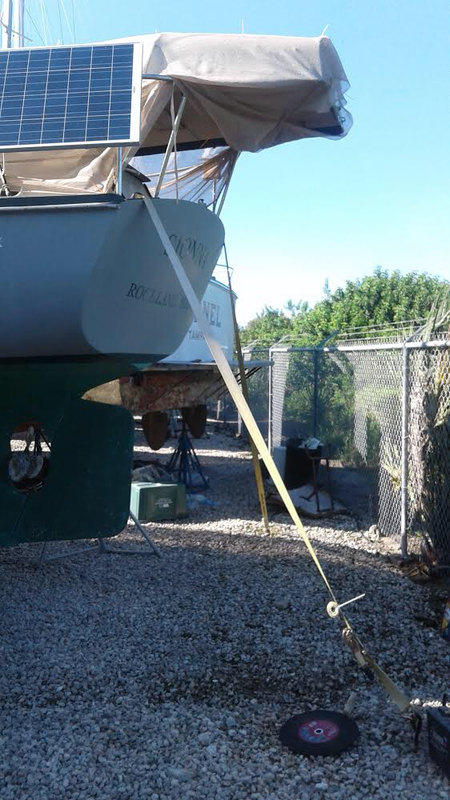 If you don’t know, davits are the “arms” that extend off the stern (or sometimes the side, on larger boats) of a vessel which have block-and-tackle attached, and are used to lift the dinghy completely out of the water for storage. This is handy, since it decreases the drag when you’re sailing, and it’s safer because you don’t have the issue of this second vessel tagging along behind you in tight quarters. It’s also a security issue – dinghies are a popular theft item in poorer parts of the world, but when it’s up on davits, it’s much less attractive to a would-be “borrower”. 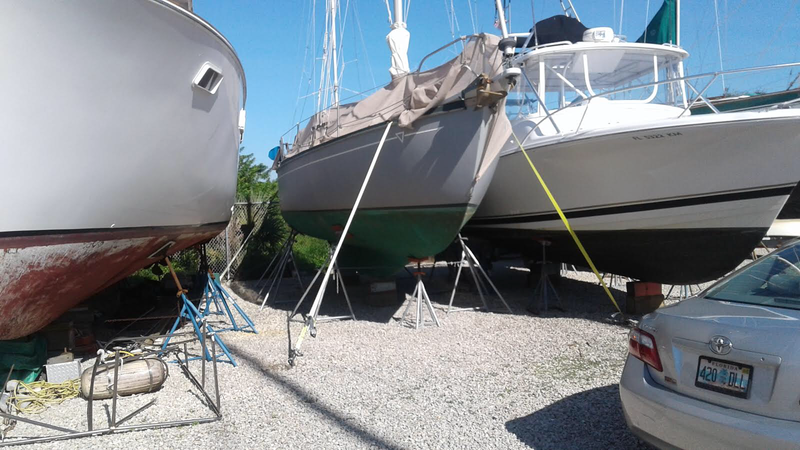 But the biggest reason from our perspective is that davits would free us from the onerous task of putting the dinghy on deck for overnight passages. Honestly, fighting with the dinghy was on both our lists of least-favorite things about cruising. Now our original plan was to buy used ones. Really, that had better be it. As it is we’re going to be hard-pressed to get everything in the car for the trip south. We received an email from the kind folks at J & R Marine Services Yesterday afternoon, stating that NO boats were blown down in the storm, and that there was no visible significant damage to any boats. After 54 years, she’s seen a thing or two. So we are feeling like we can breathe again! Other good news is that most yards and marinas on the west-central coast did well too. Interesting and sad is that there was more damage on the east coast and northern Florida than I might have expected, given the track of the storm. Titusville, St. Augustine and St. Mary’s Georgia, where we have friends and boats, all had a rough ride even with the storm diminishing in strength as it moved north. We’re sending good energy and crossing fingers AND toes for the folks who live there – cruisers or not – in hopes they have minimal damage and no injuries. Storing a boat is always a bit stressful. Storing a boat 1500 miles away from where you are is more so. And storing a boat that is also your home, 1500 miles away, adds another layer. 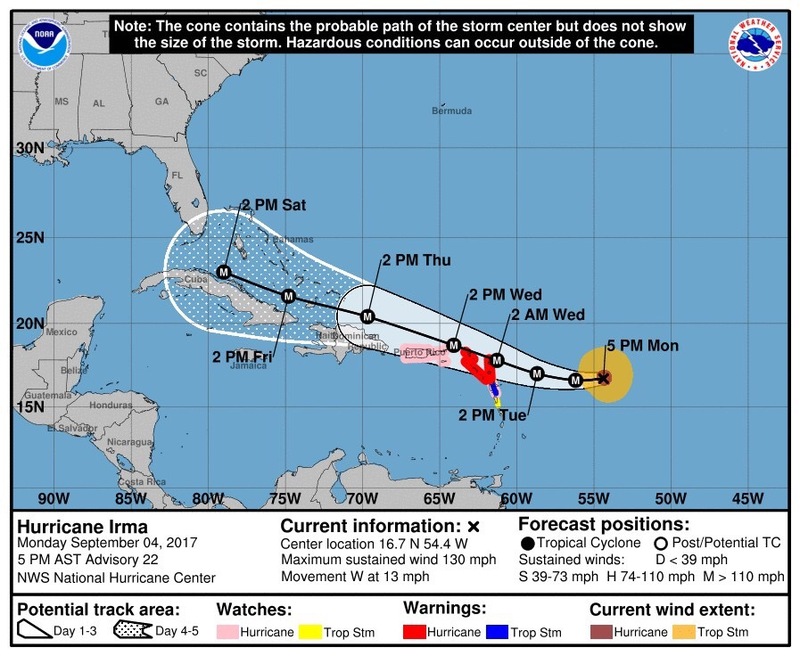 As I write this, Hurricane Irma is gradually chewing up the north coast of Cuba, having already devastated much of the northern Caribbean island chain, the British Virgins, the US Virgins and southern Bahamas. She’s elected to drop slightly south of original forcast track and spared much of the mid- and northern- Bahamas, but that southern bend has put her over Cuba’s coast and – if the predictions hold (and it looks like they will) on a direct track to the Florida Keys and west coast – and that’s where we and family have our interests. Sionna’s boat yard is now at ground zero, as is the home of Nicki’s parents. The saving grace may be that we’re both somewhat inland, where the winds will be diminished a bit by land, but it’s still going to be a bumpy ride. But it’s not just us. We lived in Marathon’s Boot Key Harbor for two months last winter, and have many friends whose boats are there, in the relative safety of the mooring field. Relative, in that for a normal storm of, perhaps category 2 (95 kts/110mph), they’d be well placed. But Irma isn’t playing normal. The water temperatures in the Florida Straits are very warm this year, about 90 degrees, and all that energy is going to add to Irma’s wrath as she crosses. She’s forecast to make a landfall on Marathon as a full Category 4 storm, with sustained winds of up to 136kts/156mph. For reference, keep in mind that each doubling of wind speed multiplies the force that wind applies is increased by 4-times. Category 4 winds will flip a car and carry it away. 5 years ago, Nicki and I spent our honeymoon in the BVI, sailing between the numerous islands of the Drake Channel, and just generally chilling out. We walked long the beach path at the Bitter End Yacht Club – which is what you see in the picture to the left. Sort of. But my point here is not to make a spectical of the damage this storm has done, and will do. It’s to help bring awareness to the plight of islanders all along the storm’s path. The destruction we’ll likely see in Florida will be horrific enough, but we on the mainland have the resources and transportation facilities to begin rebuilding and stabilizing almost immediately. Not so in the islands. These are poor people, poor nations. There are no Home Depot stores or CVS pharmacies there. There are no trucks. In many places, there may not even be a hammer to be found – they’ve all been swept away in a 220 mph wall of wind. So I’m asking you to help, as you’re able. Do a little research to find an aid organization that’s trustworthy and send some money. Donate your time, if you find a way. If you’re a cruiser, consider coordinating your trip to the islands with an aid group and fill your boat with building materials, rather than food and booze. Stay for a week to unload and help. 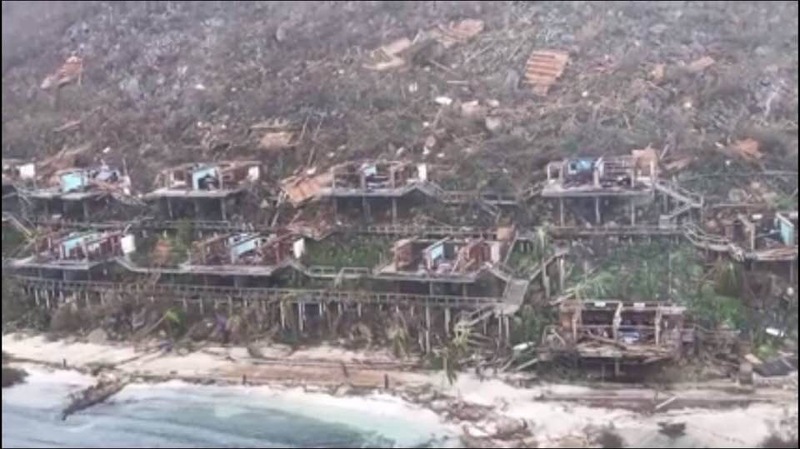 Right now, the islands don’t need tourists – they need help. Nicki & I have been planning to cruise in the Bahamas this winter, but depending on the ultimate conditions there following the Hurricane season, we may pursue doing relief work instead. Ya’ll take care of each other, ya’ hear? Fingers crossed, we wait. There’s no other word that can summon up the same visceral combination of terror, anxiety and pure fretting in a sailor. We’d do almost anything to avoid dealing with the subject – except we didn’t. “Anything” would have been bringing Sionna back north, or even not having taken her south in the first place. But instead we DID take her south, and then we left her there, in a semi-tropical area known for it’s potential for hosting nature’s most destructive weather systems. 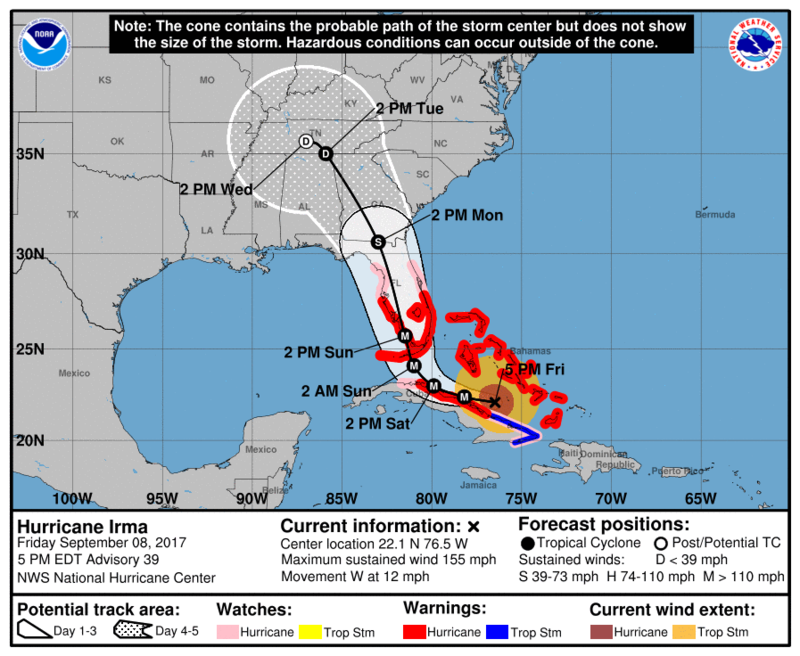 Hurricane Irma has, as of this morning, intensified to a Category 5 storm, the strongest level. Anything she encounters at that level – whether at sea or ashore – is extremely unlikely to survive unless it was constructed for precisely that purpose. 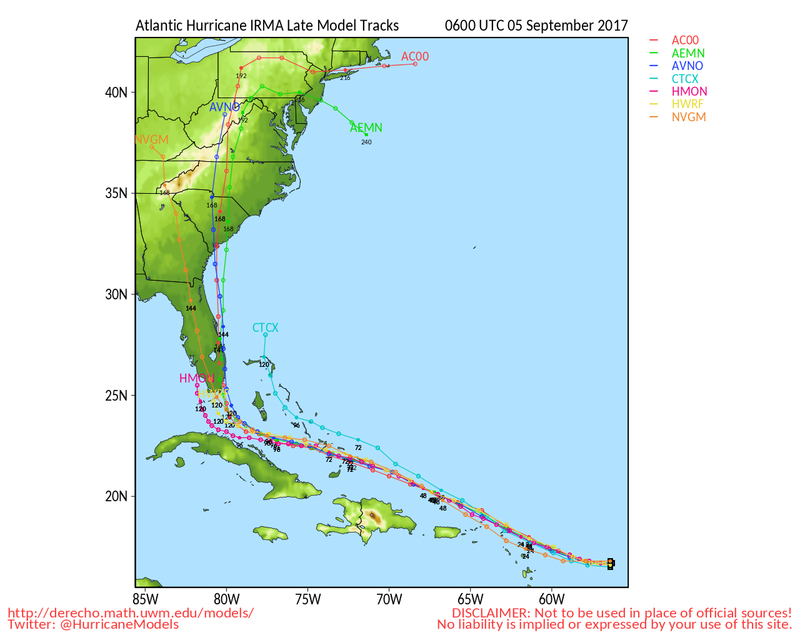 As of this morning, the “spaghetti chart” showing Irma’s likely paths has begun to coalesce into a narrow band of probability which takes the storm across the Florida Keys and on to south Florida, and north. And yes, “on north” is where Sionna is stored. So we’re fretting about our floating home, yes, but we’ve also got dozens of friends in her path, spread out from the Caribbean islands of the Lesser Antilles all the way to Georgia on the US east coast. If Irma misses us, she may hit them harder, and if she spares them, she could devastate us. So what do we hope for? I guess we hope for the best, for all concerned. 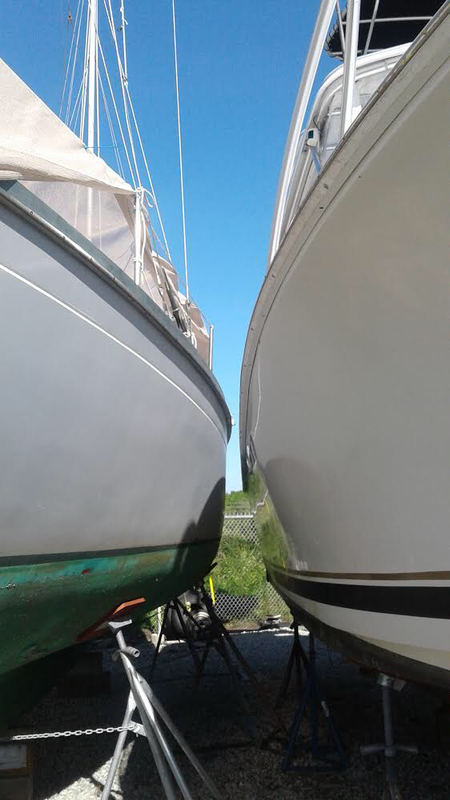 We did everything we could to prepare the boat for just this before we left Florida, and I just got a call from the boat yard down in Florida reassuring me that – yes indeed, they did install hurricane straps just after we left, and they’re busy checking boats and snugging tie-downs even as we speak. Fingers crossed and prayers to the IS said, we wait. Batten down the hatches, my friends. We’re thinking of you.